After the disaster of Pearl Harbor and the rapid advance of the Japanese forces throughout the Pacific the Allies (and especially the US people) needed to boost their moral. This attack would prove not only that the Japanese mainland was under threat and to their population that they were not invulnerable, but also would force the hand of the Japanese Army and yielded to their Navy’s wishes to attack Midway. With their code broken the attack on Midway was predicted and the reversal of fortunes in the war with the subsequent loss of most of their main plane carriers changed the momentum to the Allies. From my point of view the Doolittle Raid is one of the capital moments in World War II. Without it probably there would have been no Midway and the change of initiative to the Allies would have happened much later (though the result of the war would have been the same). The Raid was the brainchild of U.S. Navy Captain Francis Low, a submariner who in January 1942 proposed the idea. The then already famous Lt. Col. Jimmy Doolittle planned and led the raid. 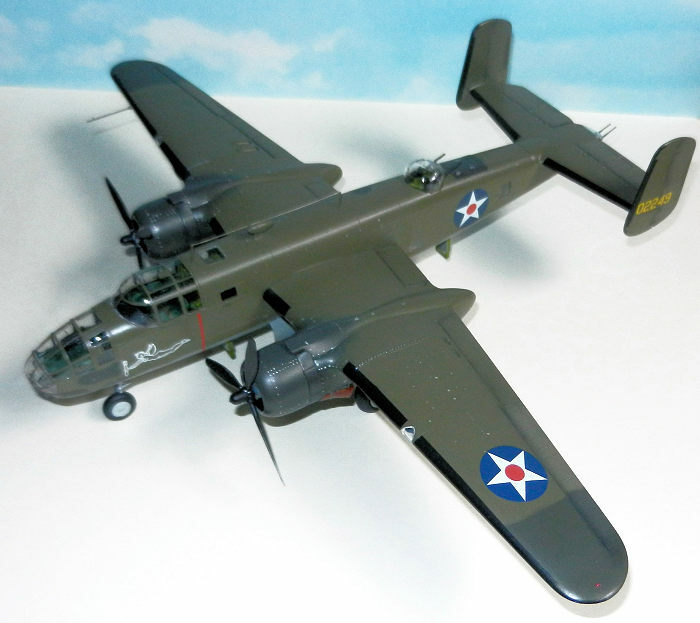 Crews were volunteers from the 4 squadrons of the 17th Bomber Group then flying the new B-25 bombers. Removal of the lower gun turret as they were difficult to operate, proved to be prone to malfunction and added unnecessary weight. 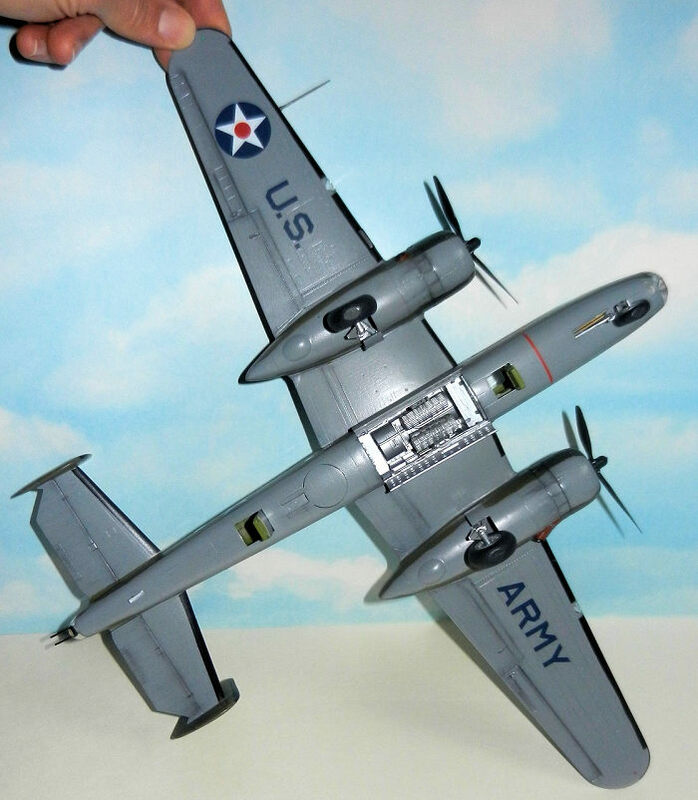 Armament consisted of demolition bombs and a M7 incendiary in most planes and 4 incendiaries for the Section leaders’ planes as these would start the fires to lead the following attackers. Special 500 pound demolition bombs were provided, through the cooperation of Colonel Max F. Schneider, A-4, by the Ordnance Department. These bombs were loaded with an explosive mixture containing 50% TNT. and 50% Amatol. They were all armed with a 1/10th of a second nose fuse and a 1/40th of a second specially prepared tail fuse (in case the first one failed). The Chemical Warfare Service provided special 500 pound M7 incendiary clusters, each containing 128 incendiary bomblets. These clusters were developed at the Edgewood Arsenal and test-dropped for effect and ballistics by the Air Corps test group at Aberdeen. The 50 caliber ammunition was loaded with special specifications. They were grouped with one tracer, two armor piercing and 3 explosive bullets. Carburetors were also modified to extend the endurance of the planes and increase the chances of landing in China. Propeller blades were replaced as it was found that planes could make only 220 mph with the worn out ones. By installing new ones the speed with the same settings changed to 275 mph! All section leader planes also carried a cine camera in the tail facing down at an angle in order to record the raid. For an excellent and detailed study about the preparation and execution of the raid you can read the Official Report prepared by the then Capt. Ross Greening. They took off from Hornet without difficulty at 8:56 am ship time. After circling over the carrier to check course and drift the other two elements of his flight (McElroy and Bower) formed up. They flew low over the water to avoid being detected. Greening tells in his book that everything seemed surreal and at times a nightmare from which he wished he would be able to wake up to find himself at home with his wife. Because in 1933 Greening had been as a young sailor in Yokohama he picked this city for his bomb run thinking that he would recognize some of the features. His was the 4th flight and besides Yokohama they were to bomb the Kosukan Naval Yard on the western side of the Tokyo bay. The planes would periodically climb to check their drift to make sure they would get on time over Japan. Some patrol and fishing ships were found along the way during their approximately 4 hour and 30 minutes flight and avoided as much as possible. When they finally made landfall they found hills instead of the flat area around Tokyo. It was later discovered that most of the planes arrived to the coast about 60 miles north of their intended crossing point because most of the compasses were out of adjustment. With a movement of his wings the formation split with one plane going further south and another one now following Greening down a valley. Shortly afterwards and without finding any reference at 500 ft over the ground the Hari Kari-er turned left to look for their target leaving the other plane flying on (Bower). At this point Reddy offered Greening a sandwich and he took a bite…but that but was not chewed or swallowed due to the stress of the situation until their flight out of Japan! The minutes flying to the target seemed hours to the crew and to safer Greening flew in between trees instead of over them. Doing only 170 mph to conserve fuel they suddenly flew over an airfield full of training planes to which pilots were walking towards…some of them waved to the B-25 in a friendly way! Out of the blue Sgt. Gardner started to shoot his .50 guns which annoyed Greening as he thought it would give them away…only for him to look to the right past his copilot and find a Tony fighter on fire overtaking them after being hit by the gunner. 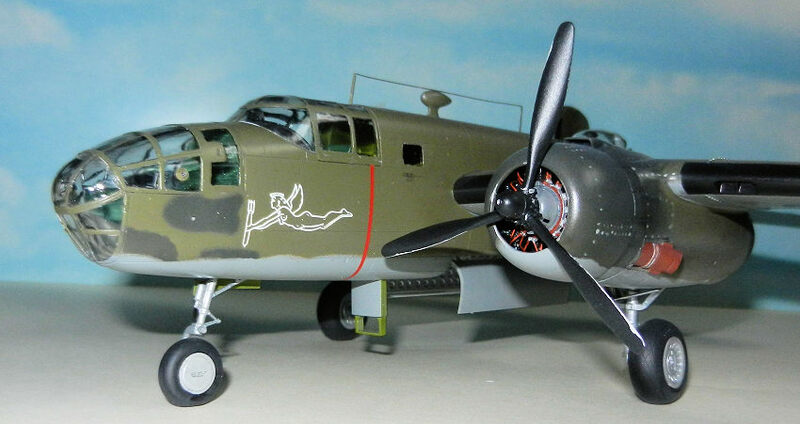 There were 3 more Japanese fighters after the bomber one of which also passed along the B-25. Now under attack Greening opened the gas and at maximum speed they endured repeated firing runs from one side to the other. The navigator (Kappeler) kept on passing little notes to Greening and Reddy to tell them what was going on as they could not hear anything over the noisy environment. Suddenly a second Tony was hit by Gardner and crashed and burn. The other two fighters now kept a safe distance behind the fast B-25. But in the excitement the gunner kept on firing continuously and this jammed one gun while the turret motors burned out (a weak point in the design of the early B-25s). Encouraged by the lack of action from the turret the two Tonys approached the bomber and started to attack again. Therefore Greening put the plane as low as possible. Even in the heat of the action and with the piece of sandwich still in his mouth Greening turned over his shoulder to take some small movies with his camera to register the smoking columns of the two downed enemies. As he was not being heard by his pilots Kappeler grabbed each of Greening’s ears and forced him to turn his head for him to be able to see the fighters…all at a few feet over the ground and doing 275 mph! Greening got the plane under some power lines in an effort to shake off the pursuing fighters. This did not work and around that same moment one of the fighters hit the Kari-er with 10 to 15 low caliber bullets from the trailing edge to the right engine. Desperate to leave the fighters behind and without having reached Tokyo bay Greening aimed the plane at some buildings in the horizon that, when approached, revelead some refinery pipelines. Climbing to 700 ft they dropped the bombs and the crew was surprised by a mighty blast that shook the plane so badly that Greening and Reddy hit their heads on the ceiling of the cabin. They had hit the refinery…and hard. Reddy was bleeding from a cut to his head. The plane nose dived out of control towards some trees and pilot and copilot managed to pulled up at the last moment. Gaining now some extra 25 mph the B-25 was finally able to leave the Tonys behind. Looking back the Hari Kari-er crew was able to witness a black cloud as high as 1,000 ft, product of their attack. The bombs had been dropped east of Tokyo at Sakura. Once the fighters were left behind they slowed down to 275 mph to conserve fuel…only to find the fighters on their tail again…and then speeding up again to 300 mph and go over the cycle all over! Finally, when they broke over the water on the opposite side of Japan the fighters gave up and turned around. On their way out the B-25 crew fired at some patrol ships hitting some crew members. They claimed 3 boats damaged or sunk. When they moved to attack a 4th one and were about to get into range to strafe it they realized that there were smoke streaks coming from the ship in their direction. There were also flashed of fire on the vessel…which turned out to be destroyer! Realizing that the single .30 caliber machine gun on the nose of the Hari Kari-er was no match against a destroyer Greening broke off the attack and flew to China. For 30 minutes the right engine run rough even after being inspected by their flight engineer and gunner Sgt Gardner. Tail wind helped them while heading south for the Chinese coast. They found bad weather 100 to 150 miles from China coast as darkness approached. They tried to climb over the clouds but the plane started to ice up so they gave up the idea. Trying to find their beacon and contact other planes using their equipment proved futile. When the fuel gauges almost showed zero Greening got the entire crew together to decide the next steps. The idea was to bail out as close as possible and walk to their destination. Kappeler made copies on paper for everyone to know the main points around the estimated area. Sgt Gardner proposed trying to crash land on a paddy field and thus they gave it a shot. Dropping from 10,000 ft to 4,500 ft they saw a light on the ground but lost it in the clouds and rain. Then they turned on the landing lights to find out trees going past their wingtips and a hill looming ahead! Opening everything up they climbed back to 10,000 ft to bail out. With 20 gallons left and after 14 and a half hours flying time the crew gathered in the navigator compartment, split the food rations, guns and checked each other parachutes as best as possible (in a mechanical action the co-pilot unbuckled his when he left his seat…and then fixed his almost fatal error by clipping it on again!). The door refused to open and it took two crewmembers jumping on it for it to finally do so. One by one they left the plane. Greening looked back at his fully lit cabin. The auto pilot, de-icers and everything was on…for the Hari Kari-er to die in all her glory. Greening decided to take with him some extra supply of food and leave his camera on the ship (w hat a shame!) He left the plane in the middle of the rainy night and felt feeling disoriented and dizzy. Hari Kari-er droned on. It was so dark that Greening could not even see his hands in front of his face. Flashing his light down he saw someone below him with a light on too. Later Greening found out it was Reddy. Some trees stopped his descent. Lt. Reddy suffered a broken knee cap and a severe cut on the forehead. Sgt. Gardner sprained both ankles slightly. After spending a miserable night they managed to get together and finding friendly Chinese farmers they were moved on from one village to the next climbing over several hills (not helped by their sorry physical state). They found out that the hills in the area were as high as 6,500 ft…2,000 more than their height when they looked for a rice paddy to crash land! After being helped by the Chinese guerrillas and taking several detours on a truck to avoid Japanese positions they made it to Chuchow on the late evening of April 20th.Over the next few days other crews arrived as well and finally on April 29th they were flown out to Chunking on a C-47. There they met General Bissel, were informed that they had received the DFC. They also met Generalissimo Chiang Kai-Shek and his wife. Finally on May 4th they arrived in India. Ross Greening returned to the US to meet his wife and family. 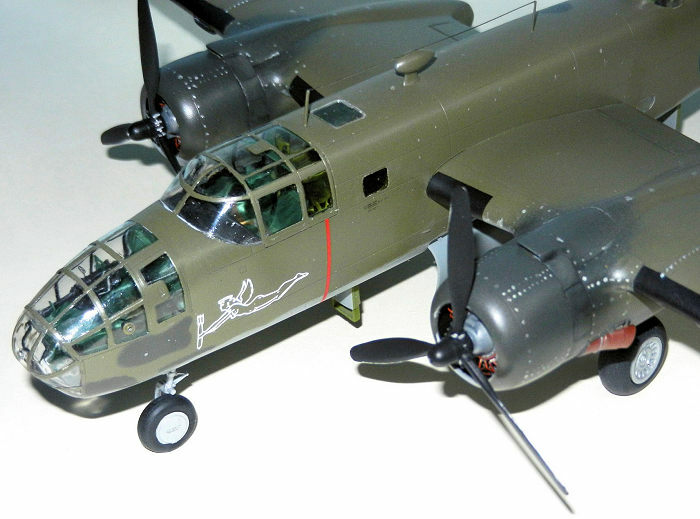 Now Ops officer for the 17th BG he was lent to the 95th flying B-26s. Leading them he fought in North Africa and Italy where he was shot over Vesuvius On July 17 1943. He became a POW, escaped, lived in the mountains of northern Italy helped by the farmers of the area during the winter only to be recaptured after approximately 6 months, sent to Stalag Luft I where as a Lt. Colonel was one of the most senior officers, helped to lift morale with his art classes and organizing different venues until they were liberated at the end of the war. He continued his career in the USAF, visited Italy in the 50s to meet again with all the great Italians who had helped him and treated him as a family member during his run away times. The Greenings (Ross, Dot and their two kids) were then transferred to Australia where he got very sick. He died in 1957 probably of a disease caught during his run away times in Italy. His book (published in 2001) is the result of the painful work by his niece Karen Morgan Driscoll along with his widow Dorothy. Karen took on the challenge after she found again a letter he had written to her many years before in which he was telling her he knew she was going to help him to get his story known. It is a FANTASTIC read with lots of great details and adventures that show the high and lows of these guys who were willing to give it all voluntarily. As a side note I want to add that one of the witnesses to the raid was the then Argentine commercial attaché to Tokyo Mr. Ramón Muñiz Lavalle. With vast experience working for the Government (Japan, Spain during the Civil war, Singapore, Malaya, Ceylon, Dutch East Indies, Africa and Arabia) he was at the right time in the right place. After the raid he stated: “I ran up to our roof and saw four American bombers flying in over the rooftops. They couldn't have been more than 100 feet off the ground. I looked down the streets. All Tokyo seemed to be in panic. Japs were running everywhere, pushing, shouting, screaming. There we no air raid shelters and I could see fires starting near the port. Lavalle witnessed war crimes by Japanese soldiers and officers and provided testimony to World War II War Crime Trials in 1946. But on the other hand this has given AM the flexibility to manufacture with the same molds later models…leaving the modeller to modify the parts to represent an early Mitchell. There are many more parts than needed for a B and other later marks can be made from what you have in the box. That is especially true when it comes to the clear parts. Firstly I collected as much information as possible to ensure that my work was as close a representation of Greening’s plane as I could make it. Thus all the books about the raid and visits to several websites to gather information about what to fix in the kit and how to do it. Details in PartsRParts are very important to fix several issues that are seldom mentioned (i.e. position and shape of windows). Armed with the information and having 30 Seconds over Tokyo in the DVD player for days (watching frame by frame some plane interior sequences for instance) I started to work on the fuselage. If you follow the directions and colours per the instructions you are going to have practically no problem. I made the modifications required to make a B version: cut out the fuel vents behind the engine booms, covered the fuel caps with putty, opened new windows per Parts R Parts great tutorial (and flipped upside down the window on the right hand side fuselage behind the wings), removed the wingtip nav lights. I started with the fuselage in Interior Green with the cockpit painted in Euro Dark Green and the bomb bay in Aluminum. Radios and instruments were painted in black with faces glossy using a drop or two of Future. Dry brushing them with aluminum highlighted some details. Axes, a few knobs and fire extinguishers were painted in red, cushions and base of control yokes in brown or olive green with belt straps for the pilots made of Tamiya tape strips given a hand of brown. The tunnel from the deck to the bomber office was painted aluminum. I like the solution that AM has for the instrument panel. It takes a lot of precision to make sure no black paint sits on the face of the dials. Added the back decal an d the instrument panel looks very realistic in my opinion. I scratch built the 9 cans of fuel and the big 60 gal one (first ones with resin pieces, the second one making a cube with 5 sides of plasticard and a round piece from the spares boxes). The little cans were “secured” using more strips of Tamiya tape painted brown and the larger tank sitting on top of the ventral turret place was given a hand of grey with some metallic tones. Then I moved to the bombardier’s office. As the plane represents how it looked just before take off the Mark Twain was not added (it was stored away) and the .30 mm was placed on her support on the right side of the office. Painted in Euro Dark Green I made a couple of modifications: installed a scratchbuilt s upport for the Mark Twain bombsight and the storage for the 30 mm gun which was also completely scratchbuilt using tiny pieces of plasticard following screen shots I made from the movie. The .30 machine gun received a photoetched sight and carefully secured in place. Following the instructions I first secured the greenhouse on the left side and when thoroughly dried I glued the right side. This helps the nose section achieve the proper cross section width. The area where I struggled considerably was the fit of the nose to the fuselage. The side consoles of the nose overlap with some structures on the fuselage bulkhead and required some filing. Even with this the nose was somehow pushed out (I track the problem to the nose weights. When dry fitting the area everything was perfect. Once the noseweights were in place the bulkead was protruding a little bit and it started a chain reaction). No matter how much I sanded the union I ended up having to use glue, putty and thin plasticard to bridge the gap. It took several nights to achieve a smooth union. 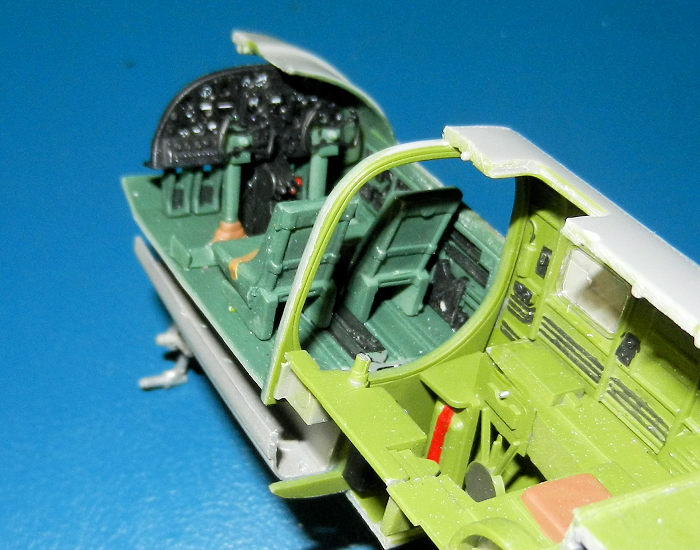 With this accomplished I added a compass on the edge of the instrument panel (per movie) and scratchbuilt the sunshades for the pilots with a piece of wire and 2 of plasticard painted in Interior Green (again, as seen in 30 Seconds over Tokyo). The clear part for the cockpit was glued (again with some difficulties to close gaps). To the nose glazing I added the holes for the machine guns (not drilling but cutting the piece in half and gluing one half internally and the other one to the exterior) This was only done on the left side as for the front side, as seen in pictures the rounded part was not sticking out so I left it flat. With 2 pieces of short wire I replicated the contracted swinging elastic supports for the front machine gun that hang on top of the gun opening (the seque nce of the movie where the removal of the gun from storage and installation on the nose minutes before the attack gives lots of details for the modeller). On to the engines…another challenge! After checking the parts and thinking it over I realized that, though a little bit damaged during shipping, the engine cowls from Parts R Parts were better and would require less surgery and work than the original AM ones. So I removed the few broken cowl flaps and replaced them with thin plasticard. I oversanded the pouring stab for these parts so then I had to add some 2 part epoxy glue to rebuild a flat front area that would properly match and fit the back of the engine cowlings…talking about these it was very easy to open up the front end using sanding paper to remove the excess of plastic previously marked with a pencil and a template. The carburetor intake supplied by AM is wrong and thus replaced with the Parts R Parts one after sanding it a little bit. Installed ignition wires (using copper wires) as the AM plastic ones are attached to the crank case and the ones that are supposed to go to the back row are too short. 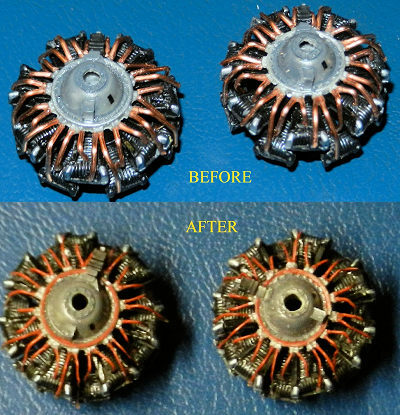 In my case I first used wire that was too thick (more than wires it looked like pipes going to the head of the pistons!) and so after careful (and frustrated) consideration I pulled out all the 28 wires and replaced them with thinner ones that were then pained using rust Acrylic paint. The engines were painted black with lots of highlights in aluminum and the crank case in grey with a little rectangular decal (from spares) to represent the plaque present on the real thing. By using the AM cowling and discarding the wrong carburetor intakes there is a rectangular hole on top of the cowling. This was filled using layers of plasticard and putty until a rounded surface matching the rest was achieved. With engines, exhausts and flaps in place I installed the cowling. 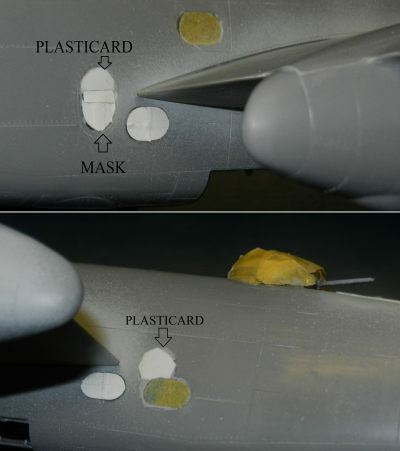 Some minor gaps between the back of the cowling and the front of the flaps were covered using plasticard, putty and patience. There was absolutely no problem mating the wings to the fuselage. In regards to the tail assembly there were no big problems except for some poor fit and gaps between horizontal surfaces and fuselage. Nothing too critical though. 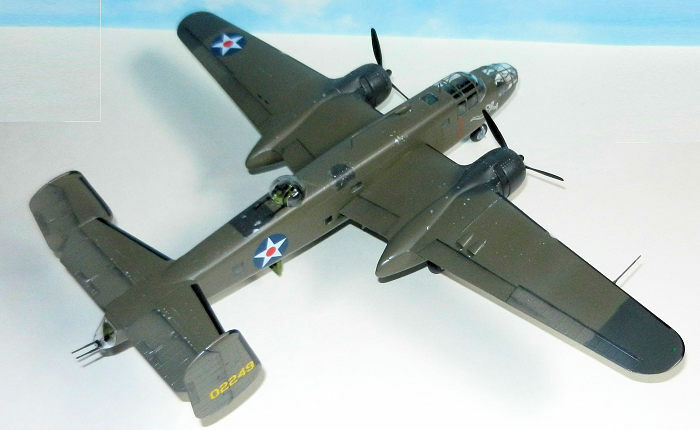 Now the armament: Hari Kari-er, as a lead plane, carried 4 x incendiary bombs as mentioned above. I purchased one from Parts R Parts and using a damaged copy I made several casts using Plaster of Paris. With two part epoxy glue (the type that comes in a gun with 2 pistons to ensure correct proportions are used) I filled the molds and after the glue had dried I pulled the parts out. 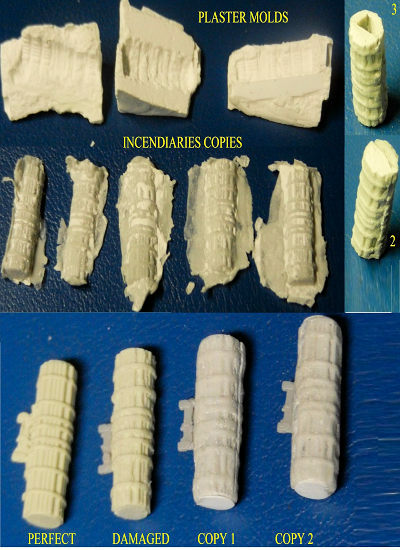 Certainly there was (irreversible) damage to the molds but having made some extra copies of them I was able to secure enough half or thirds parts to put together 2 more incendiaries in a slow process. The round endplates for the 2 copies were made with thin plasticard and helped to cover the holes from the assembly of sub sections. AM bomb brackets were used on my resin copies and then the 4 x M7 were painted first in very light grey and then aluminum with some black pastels dust used to highlight some details and shades. Panels were re-scribed and rivets added using a riveting wheel. The bombs were installed in the bomb bay and then covered with a large piece of paper. All the other openings were filled up with tissue paper and with all the AM masks in place (some are too large so I had to cut them in 4 and overlap them to get the correct dimensions) I was ready to go the paint station. The plane was given a coat of light grey to check for imperfections. Some were found especially in the nose area but they were very easy to fix. Frames were painted in black and the main panel lines roughly highlighted. Then the best part started: the camo itself. First the undersides received a light hand of Neutral Gray. Having checked the references very carefully (and depending on the book some details are lost) I first painted all the (fabric covered) moveable surfaces on a lighter shade of Green Drab. These were masked and then the freshly painted (in Minneapolis I am guessing) parts received a hand of Green Drab with a couple of drops of black. These were the skin reinforcement behind the turret, the wing tips (clearly Hari Kari-er was one of the planes that had received tactical wing tip colours before the mission), an area between the football antenna and the turret on the right side of the fuselage, the engine cowlings and some blotches on the nose below the greenhouse. Now with these also masked and a smooth demarcation line made using worms of Blue Tac I sprayed the model with Olive Green. The leading edges were painted in black (de-icers installed for the mission). The exhausts were painted in black (openings) and rust. 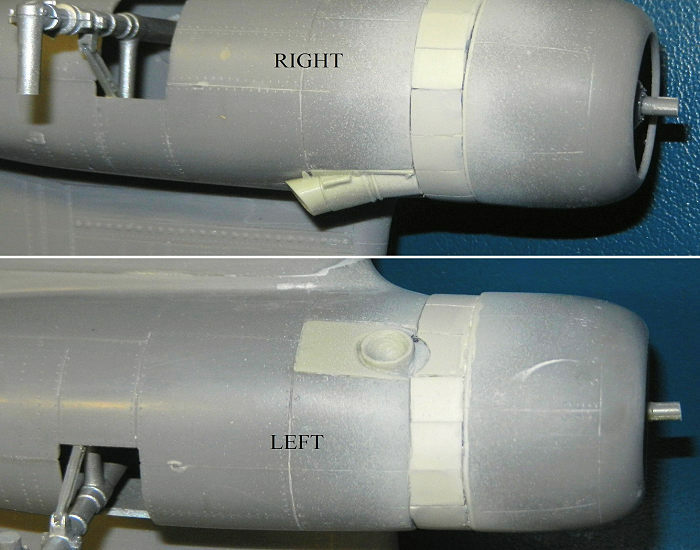 Position lights on the tail received a drop of red and white paint respectively. Black pastel powder was applied to moveable surfaces, exhausts (also used Rust for this area), cowling flaps edges and any other area that could have had some dirt. The paint of the planes was heavily chipped thus using a silver pencil and also a marker (taking the paint and applying with a tooth pick) I highlighted the engine fasteners and made the plane look “tired” and worn out. After learning how NOT to get Future running streaks on the planes (or run the risk of as in my case it was the most stressful part of making a model) using a couple of YouTube videos I applied several light coats to Future till I build the proper shiny layer. Decals came from the kit. Though old they sill worked very well and reacted with no fuss to Set and Sol. The only ones that broke in 5 or more parts were actually the most important ones and the hardest to get…the angels carrying the bomb! With lots of patience I managed to place the tiny broken parts in place. I sealed the decals with Semi Gloss Acrylic varnish and then the moveable surfaces, the exhaust stains and some panel lines (running in the direction of advance of the plane) received a light coat of Matt varnish to create some contrast and several degrees of colour depth. I glued the wheels, propeller blades (chipped) and hub, tail wheel, pitot tube and two fuselage antenna masts. Landing gear doors, bomb bay doors and access ones were next. From a Hasegawa P-40 I took the 4 clear position lights and these were placed on top and bottom of the outer parts of the wings. A drop of clear red and green was added. A piece of tiny clear plastic was converted into the position light just ahead of the football antenna. The fake guns were added to the tail cone which also received 4 strips of black decals to represent the painted on “runners” for the guns. 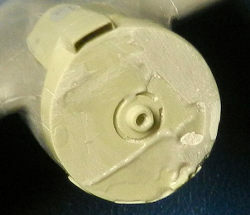 A piece of plastic painted black was installed in the tail opening to represent the camera that recorded the raid. The tail cone was glued in place. And finally the two last details: the antenna running between the 2 tiny masts on top of the fuselage (stainless wire) and cut white strips of decal represent the “tape” (?) on the front right panel of the nose. A 5-month long fantastic journey. I am very happy with the results achieved to honour Ross Greening and the guys who undertook one of the most courageous missions of World War II (in my opinion). Research, work and details added to the kit demonstrate my level of admiration towards the volunteers of the 17th Bomber Group.